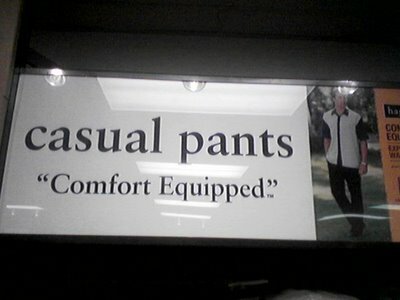 The “Blog” of “Unnecessary” Quotation Marks: then again, how does one "equip" pants? posted at 4:56 AM???? What are you, crazy? Even without the quotes, I'm not entirely sure what comfort equipped means. They equipped comfort? How does one do that? Just cashmere, silk, flannel, cotton balls? Actually, it's a trademarked quote (little TM in really small writing), so I think this one actually might be kosher - "comfort" equipped wouldn't be :) In any event, this "blog" is "awesome", and I will continue to "enjoy" "reading" it.